Having the right, scalable, IT systems to handle large compute workloads, while tapping into massive data sets, is critical to a project's success and even the success of your business. HPC solutions, powered by Intel® technology, offer greater value potential by combining the density of blade computing with the economics of rack-based systems. 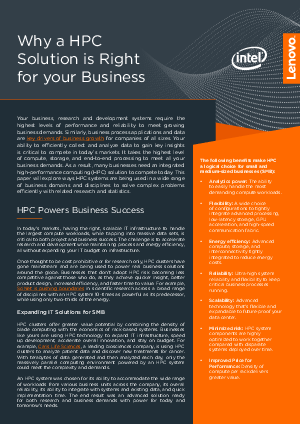 Learn how businesses like yours are using HPC technology to expand IT infrastructure, improve development, accelerate overall innovation, and stay on budget.